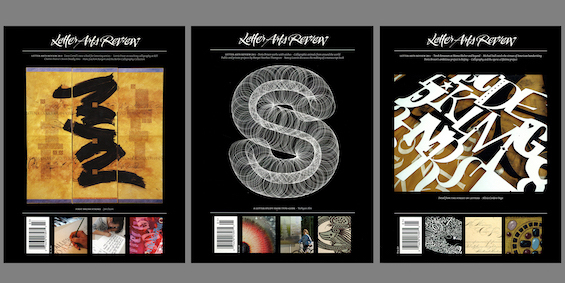 Looking at letterforms within graphic design and beyond, Letter Arts Review is an international quarterly that focuses on all kinds of original lettering. Editor Christopher Calderhead presents highlights from his ten years at the magazine. Articles in the magazine have included profiles and examples of work from such contemporary luminaries as Luca Barcelona and the stonecutter Nicholas Benson. Popular forms such as sign painters making ephemeral notices for supermarkets. Kabuki signs in the bold Kanteiryu script from Japan. Monolithic inscriptions from Kathmandu. And historical surveys of the lettering of Piranesi and ancient manuscripts. Letter Arts Review presents the highest achievements of historical and contemporary practitioners, but also asks how lettering fits into the world of art, design, and everyday life. Christopher Calderhead is a lettering artist, designer, and author of Calligraphy Studio and, with Holly Cohen, The World Encyclopedia of Calligraphy. For the past ten years, he has taught design and calligraphy in the Undergraduate Communications Design department at the Pratt Institute. This event is co-presented by the Society of Scribes. Registration is requested here.